Meet Razan al-Najjar, the young Palestinian hero paramedic martyr lost her life on 1st of June 2018 while trying to save the lives of others, she was shot at her chest deliberately by an IDF sniper terrorist. In only 2 months at least 116 protesters were massacred by IDF terrorists, more than 13,000 Palestinians are injured out of which over 3,600 were wounded by live ammunition. The IDF terrorists shot dead 63 civilians and wounded almost 3,000 on one day alone in what’s called now ‘The Gaza Massacre‘. 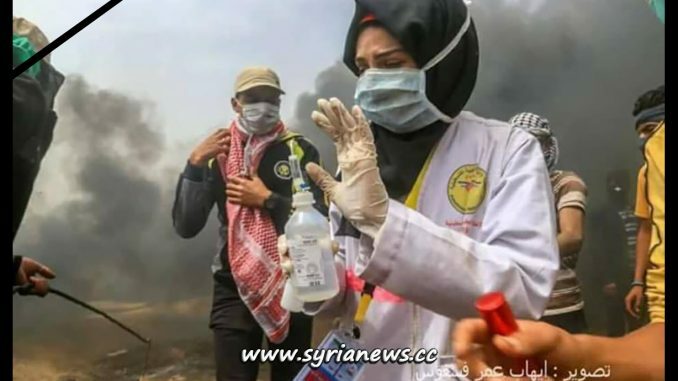 Lebanese based al-Mayadeen news channel interviewed Razan al-Najjar (Arabic), a 21 years old Palestinian volunteer paramedic at the fence of the world’s largest concentration camp in Gaza just before Razan was shot dead by an IDF terrorist sniper.